Shooting fall colors in beautiful Gunnison National Forest; this aspen leaf fell from the brightly colored canopies above and nestled into the ferns of the forest floor. CLS Setup info: lit with two, small Nikon SB-R200’s controlled by the SU-800 Commander head on the F6. 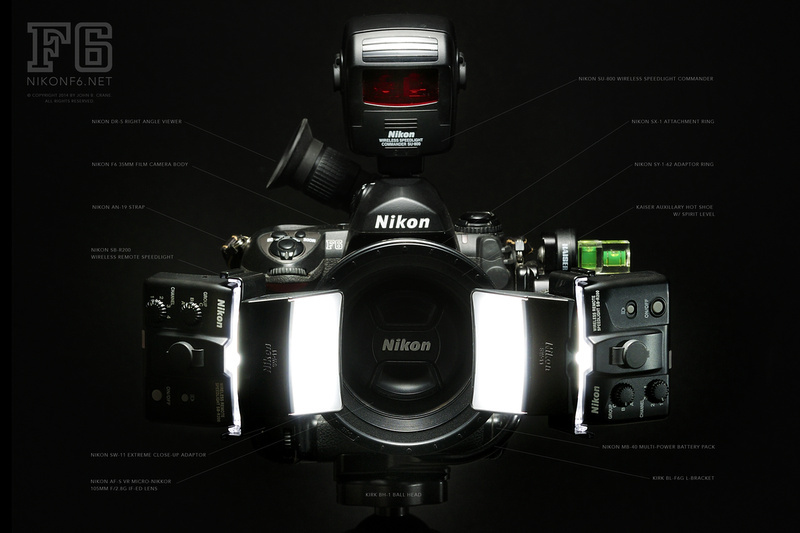 NIKON CLS GENERAL INFO: CREATIVE LIGHTING SYSTEM: Let’s face it-once you get beyond the warm & fuzzies of handling the F6, what really sets it apart from other 35mm film cameras? Couldn’t you just get a F100 or pick up an F5 on ebay and take the same picture. To a large extent, I’d say yes – if it weren’t for the CREATIVE LIGHTING SYSTEM Nikon has built into the F6. But how on earth do you use it? The unarguably unique feature of the Nikon F6 over any other Nikon F-series film camera – or any other 35mm film camera – is its ability to leverage Nikon’s Creative Lighting System. No other 35mm film camera has this level of functionality built into it. CLS isn’t some black, lost art for the Yoda’s of photography. So many folks are confnused by CLS. I was at first. I tried to find books on it at Barnes & Noble, Amazon, and came up with one or two that were OK, but nothing I’d consider comprehensive when it comes to the 10,000 foot view. I’m going to try to debunk the perception of complexity of the CLS. Because in my opinion, warm & fuzzy, “feel-good when you hold it” stuff aside, CLS is what separates the men from the boys; it truly solidifies the F6 as king of the hill in 35mm film cameras. CLS isn’t as difficult as you first think, so hang in there and take a look at this new and growing section. For a great read on general use of Nikon flash systems, do yourself a favor and pick up big Joe McNalley’s “Hot Shoe Diaries.” It’s where my “big aha” came from and is a must. CLS – WHAT IS IT? The short answer is, using contemporary Nikon flashes on contemporary Nikon cameras. Not studio strobes, not pocket wizards, not other 3rd party lighting solutions. It’s a Nikon specific thing. Further more, it’s a relatively new thing (sorry but don’t know the year it was born) that’s been really helped along by the whole digital shooting movement. So, if I take my little SU-800 head (pictured at left atop the F6), and put it on an F5, an F4S, F100, F-fill-in-the-blank (no pop-up flashes are present on these older cameras), you still won’t be able to shoot wirelessly with it. This is because not only do those cameras lack a pop-up flash (like all F or D “pro” model cameras -except the D700), but the older F-mount film cameras also lack the CLS circuitry, the electronic GUTS to understand what the SU-800 is telling it to do. I guess technically today, CLS encompasses any use of Nikon flash, including non-wireless use. So, if you put your SB-600 flash on your F5 are you using CLS? I don’t know. I think not. I think you’re just using a flash. So for our purposes here, I’m going to use CLS as synonymous with shooting wirelessly. In other words, using Nikon’s CLS system to trigger flashes that aren’t physically attached to your camera -either mounted on the camera’s hot shoe, or with some sort of cord, like the SC-29. With CLS, one of the whole ideas is to get the flash off the camera – and to be able to control multiple lights from multiple directions – so light is coming from a direction other than what the lens is seeing. Now, you don’t ALWAYS need to do this, but trust me-it looks way better when you do. Read Joe McNalley’s “Hot Shoe Diaries” book and he’ll school you on the different methods. He’s the grand master. It’s an enlightening book, really. Well worth whatever it costs. But I won’t attempt to re-word what Joe explains so well in his book. Just get the book. I’ll concentrate here on the 10,000 foot view and some nuts and bolts of getting up and running. Once you get the basics down you’ll get into your own creative use for it, which is what the system is all about. WHY BOTHER WITH CLS? To those who think they don’t need to bother with flash in their photograph-making process; who say “they prefer natural light,” think about this: Often you might see a photo and think wow, there’s just something really nice about that shot. Chances are good that “something nice” came from discreet, creative use of flash by someone who finally said enough is enough -I’m gonna figure out this whole flash thing if it kills me. Don’t be afraid. Flash is your friend. And once you get it figured out, you’ll be able to stop spending thousands of dollars on the latest DSLR that can take reduced noise pictures on the dark side of the moon. Think about what will set your pictures apart and make them special, besides the content. How you render, or record, that content is a creative decision, and flash can be an enormous part of making your photographs even more interesting and fun to look at. Flash isn’t voodoo. It’s pretty straight forward. If you’re lucky enough to have a digital camera AND an F6, by all means, use the digital camera to experiment ’till the cows come home, seeing what works. Once you get it figured out, shoot the “real photo” with your F6. So to be clear, this CLS section is just as much for digital shooters as for the F6 users, unless it states otherwise. I’ll include an F6 specific section to separate it out for those interested. PARTS & PIECES Nikon’s Creative Lighting System consists of a bunch of different parts and pieces, so rather than getting into a comprehensive list right now, I’ll start with what might be considered the probable first-timer scenarios. For a good overview of CLS components, visit nikoncls.com Scenario 1: You have a contemporary Nikon DSLR with a pop-up flash (like a D70, D80, D90, D200, D300/s, D700, whatever) and that area of the CSM (Custom Shooting Menu) is largely unused because you have no idea what it’s for. You think the pop up flash is good enough, and why incur the cost and brain damage of trying to learn something only “professional photographers” use? The answer is, because you’ll make much, much better photographs with no brain damage. Promise. The first thing you’ll need to do is pick up a flash. Like an SB-600 (about $200) or if you have lots of money and room in your camera bag, an SB-900 (about $500-ouch). Don’t worry – the SB-600 is plenty powerful enough for most general beginning applications, has the CLS circuitry built in, and at about $200 it’s a screaming deal. Now you have the bare minimum tools to take advantage of Nikon’s CLS. And though it could be considered “minimum system requirements” in computer speak, it’s extremely flexible and capable, and your photographs will instantly improve. Promise again. Scenario 2: You have a flash (SB-600, 800 or 900) and a DSLR in the list above, you’re just not sure how to connect all the dots – so that part of your camera’s CSM goes totally unused. If this is the case, you’re in luck. Within minutes (really), you’ll be taking better pictures than if you just had your flash sitting in your camera’s hot shoe. If this is you, try this, step-by-step. This scene was lit with 2 off-camera Nikon Speedlights at about 45° to either side of the camera, pointed up at the 8-foot high ceiling. The camera was set to Slow-Sync, Matrix metering, Aperture Priority using TTL flash.The scene’s even illumination is a result of the light hitting the white ceiling and effectively turning it into a huge light box. This scene was lit with 2 off-camera Nikon Speedlights at about 45° to either side of the camera, pointed up at the 8-foot high ceiling. The camera was set to Slow-Sync, Matrix metering, Aperture Priority using TTL flash.The scene’s even illumination is a result of the light hitting the white ceiling and effectively turning it into a huge light box. STEP-BY-STEP CLS Setup & Use: 1) Get your SB-600 case and open it up. Get the little, black plastic thingy that slides in the top pocket (it’s called an AS-19) and get your flash out of the pouch. Put the AS-19 (black plastic thingy) on the bottom of the flash and flip the little lever at the bottom of the flash to hold it onto the foot. Now your flash will stand up by itself so you don’t have to hold it. 2) Your Flash: Turn it on and flip it around so you’re looking at the back. Press and hold down the ZOOM and MINUS buttons together to enter the flash’s CSM (Custom Setting Menu). If you’ve never used your flash in this mode before, you will probably see “OFF” and beneath it a little squiggly line and arrow head pointing to the right. If you don’t, press the MINUS button until you do. When you do, press the MODE button once to change “OFF” to “ON.” Then press and hold down the ZOOM and Minus button together again. This gets you out of the CSM menu and you’re ready to start using your flash remotely. Before you do, however, you need to do one more thing: look at the back of your flash ( If your flash has gone to sleep already, just press the ON/OFF button quickly to wake it up again) and note the number above the little CH, and the letter above the little GROUP. THIS IS IMPORTANT! It’s the Channel (CH) and the GROUP your wireless settings will use. Put your flash on the coffee table a few feet away, and leave it powered on. Nikon CLS example 3) Your camera : Turn it on and press the pop-up flash button at the left of your flash. If your camera has two little buttons, press the one that doesn’t have the little white, jagged arrow on it. This should pop up your camera’s flash. 4) Turn your camera so you can see the menus on the back and press your menu button. Each camera is going to be a little different, but you’re looking for your “Bracketing/Flash” settings. On my D300, its under the little pencil icon at menu left, and it’s item “e.” Select that menu item. 5) You should now be looking at a number of different options, such as Flash Sync Speed, Flash Shutter Speed, etc. You’re looking for the menu item that says something like “FLASH CONTROL FOR BUILT-IN FLASH” Mine has a little C and a jaggy arrow pointing down to the right of the menu. When you find it, select that option. 6) The D300 has 4 options available for the built-in flash: TTL, Manual, Repeating, and “COMMANDER MODE.” You want COMMANDER MODE. 7) You’ll get a new set of options that need to be set here, then you’re set. Set your Built-In Flash to OFF. Do this by pressing your camera’s circular navigation pad (the little disc with the arrows on the back of the camera) until — appears in your MODE menu. This means your on-camera flash won’t fire, allowing you to more easily see if your other flash did fire (you may notice it will fire anyway. this is a “pre-flash” your camera uses to see how much light it needs to put out a nanosecond later when it takes the real photograph). Nikon CLS samples, Creative Lighting System examples 8) Notice beneath where it says BUILT-in Flash, you’ll also see the GROUP A, GROUP B section. This allows you to control two or more remote flashes independently. We’ll get to that later. They’re default should be 0, meaning each is equally weighted. Leave it alone if there’s a 0 in the Group A and a 0 in the group B. 9) At the bottom of the this menu you should see a Channel setting. Remember back in step 2 we looked at the CHANNEL and GROUP settings on the back of the flash before we put it on the coffee table and walked away? This is where you put that number in. Hopefully it already says 1. If not, use your circular pad with the arrows to make it say “1” because this is what your flash is set to. When you’re done, click OK, or ENTER or whatever your camera’s menu system tells you to do to save your changes. 10) Now, point your camera at something, like your flash, and shoot a picture. Your flash should fire and your photograph should show it. Nikon CLS example, Creative Lighting System sample Image made with Nikon D3s using one off-camera speedlight, bounced into Lastolite Tri-Grip held above scene. Image made with Nikon D3s using one off-camera speedlight, bounced into Lastolite Tri-Grip held above scene. You just used Nikon’s CLS. Simple as that. Everything else builds on this functionality. Your flash isn’t physically connected to your camera with any kind of wire, nor is it mounted on top of your camera. This by itself is going to give you better pictures. Try something: take a bobble of some sort on your coffee table, a Christmas ornament or piece of fruit. Clear the coffee table off except for your piece of fruit and your flash. Bend the head of your flash down so it’s shooting at your piece of fruit from the side. Now shoot a photo from the front of your coffee table. Move the flash to the other side, now around back, now at an angle from the front-experiment, and you’ll see just how much of a difference the direction of the light makes in the photograph. It’s HUGE! To make it better for you why not change your coffee table to something different? If you had something like furniture in fashion’s white gloss coffee table then your photos would be out of this world. NIKONCLS.COM: All things CLS. This is a great resource for in-depth information regarding specific components of the Nikon Creative Lighting System. back to top That’s it for now. Please check back soon.